Here you will find our full range of 'pre-bundled' PA packages for hire, catering to a variety of PA (public address) / sound reinforcement needs. The following packages can be customised to suit any specific requirement, and we can build a PA system package from scratch to suit the needs of your event or venue. 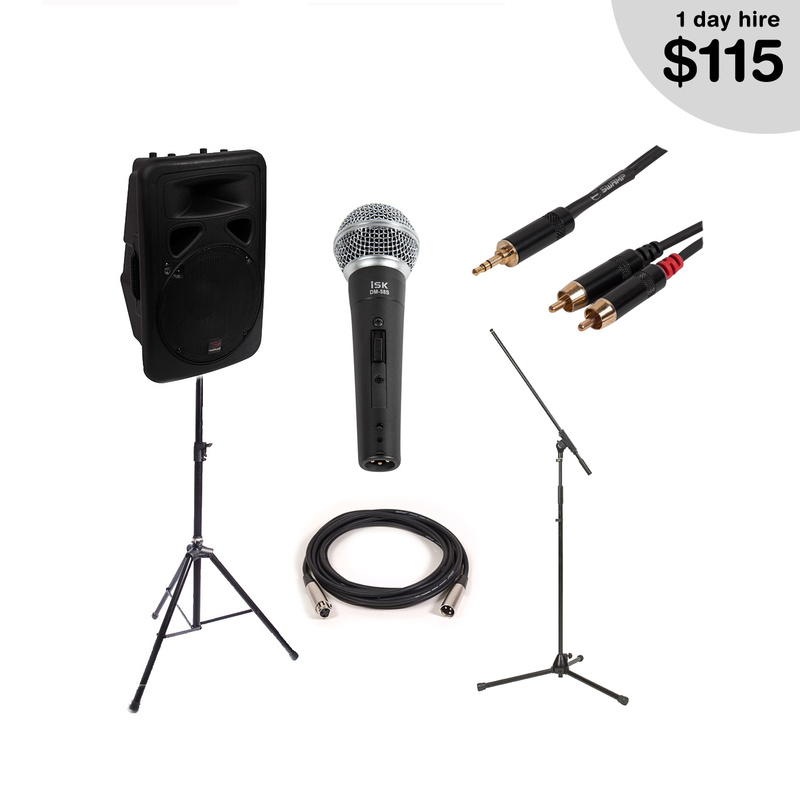 We offer Canberra's best pricing on 'dry hire' PA systems that can be picked up and returned to our premises in Fyshwick on weekdays and Saturdays. 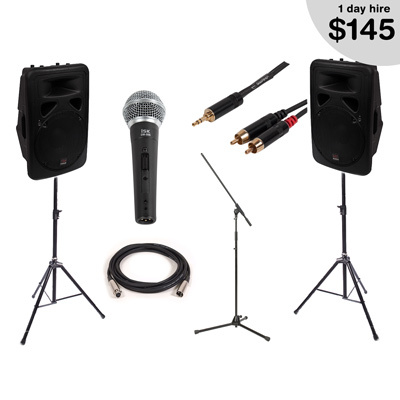 We provide setup walkthrough's on pick up, and can also provide a written guide for our Party and Wedding pack bundled PA systems. We can offer delivery, setup and pick up services within the ACT. Costs depend on location, the time / day of setup and pick up and any sound check requirements. Please contact us and provide the above information for a quote. 3rdPhase can provide professional sound and mixing services to support our a PA system hire. Our staff have certifications and experience that differ; including diploma accredited students from CIT and a front of house mixing engineer with many years experience on tour in Australian and around the world. We can tailer the right sound technician for your event and PA system. Book 8 weeks in advance and get 30% off the booking! Our most popular PA system that is the perfect solution for parties and large gatherings where dancing music and speeches are taking place. With many ACT music venues supplying in house PA systems, DJ's can often get away without their own system. Though when you're sprung with a gig and asked to bring a PA, consider our 1700W DJ PA package. The PAJ-12BM 12" tops are rated at 180W RMS, but have a 'bi-amped' design allow for high SPL at the RMS power level. This means mids and highs come with clearly and strongly without being piercing. On board EQ will also help to tweak the tops to the room and your sound. The 15" sub outputs 500W RMS / 1000W MAX, which is loads of power for bass heavy tracks and music genres. The MA-15SUB-A also has stereo inputs and Hi-Pass outputs for connecting to each 12" top, maintaining 'true stereo' and removing low frequencies from the tops. The sub also has its own crossover knob to control the frequency cut-off point/slope of the sub. Suitable for up to ~160 people. 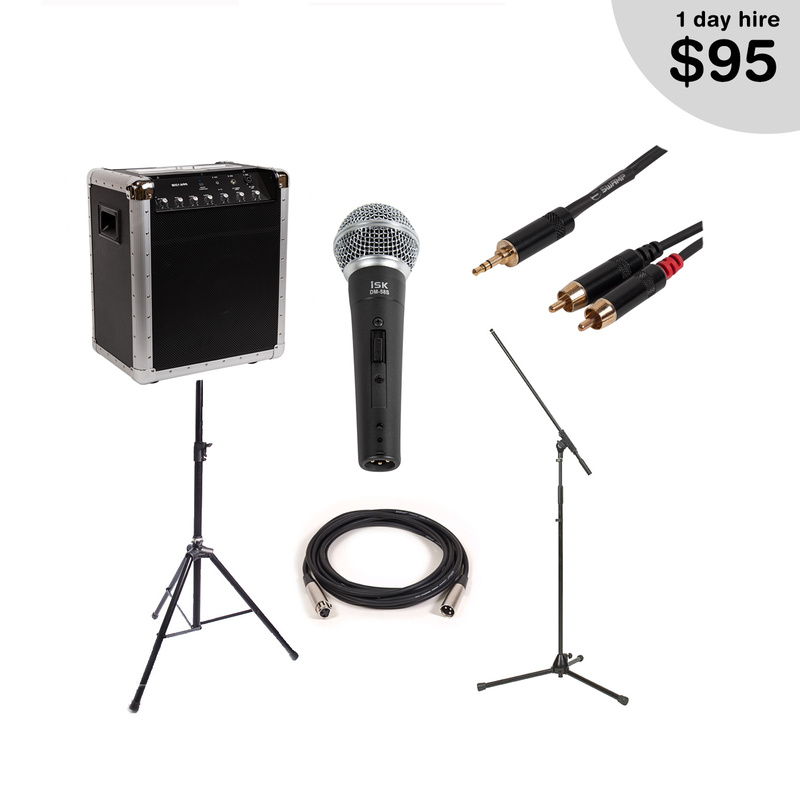 Solo acts to 5 piece bands playing around Canberra can find this package ideal for small venue performances, where only vocal amplification and foldback are needed to supplement guitar amps and a drum kit. The STE212A powered foldback monitor has 300W RMS or power and 3-band EQ to allow tuning to remove feedback and enhance clarity. The S8-MK2 mixer has 4x Mic inputs and 2x stereo Line inputs. 1-knob compression available on each mic input, AUX send with pre/post section and an inbuilt effects send. Original and cover bands alike often play venues with in house PA systems and may only need to being amps and a foldback monitor, though gigs can arise when you need to bring a PA.
Our 2500W PA package is an ideal system for Front of House applications in Canberra pubs and clubs where there is high general noise level and loud, tight, thumping bass is often required by the venue. The subs have Hi-Pass outputs for connecting to each 12" top, maintaining 'true stereo' and removing low frequencies from the tops. The sub also has its own crossover knob to control the frequency cut-off point/slope of the sub. Suitable for up to ~180 people. This 2100W 'Low-Bass' system has an 18" sub that goes to super low 25Hz - giving tight, thumping bass in the super low frequency range. Coupled with high powered 15" tops running on standalone 19" power amp that outputs 450W per side. The amp and speaker match perfectly, meaning you can run the amp full, and then ride the volume on your decks as you please - this allows a maximum headroom and a wide range of dynamics in your mix. Suitable for up to ~200 people. Cost effective, great sounding 2600W front of house (FOH) system available for hire in Canberra, ACT. Featuring a dual 18" subwoofer that delivers a deep low end that will excite and delight both patrons and musicians alike. High powered long throwing 15" tops disperse sound evenly over audiences in front of stages up to 10m wide. Each speaker is driven 'in series' off 1 side of the 1300W amp, delivering 650W to each speaker. 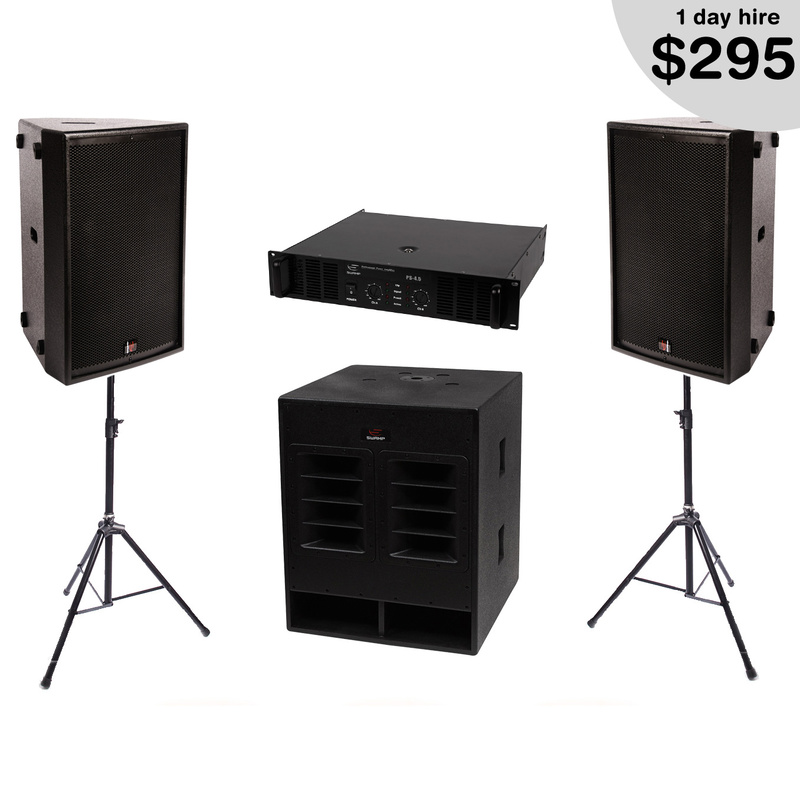 Plenty of power for medium sized public gatherings both indoor and outdoor. A digital signal processor is included and pre-tuned with our 'ideal' crossover settings for the system. However an laptop can be connected via USB to access the editing software for the DSP, allowing for customised EQ, Crossover, Gates, Compression, Limiting, Filters, Delays to be configured by the user. Suitable for up to ~350 people. Cost effective, great sounding 4200W front of house (FOH) system available for hire in Canberra, ACT. 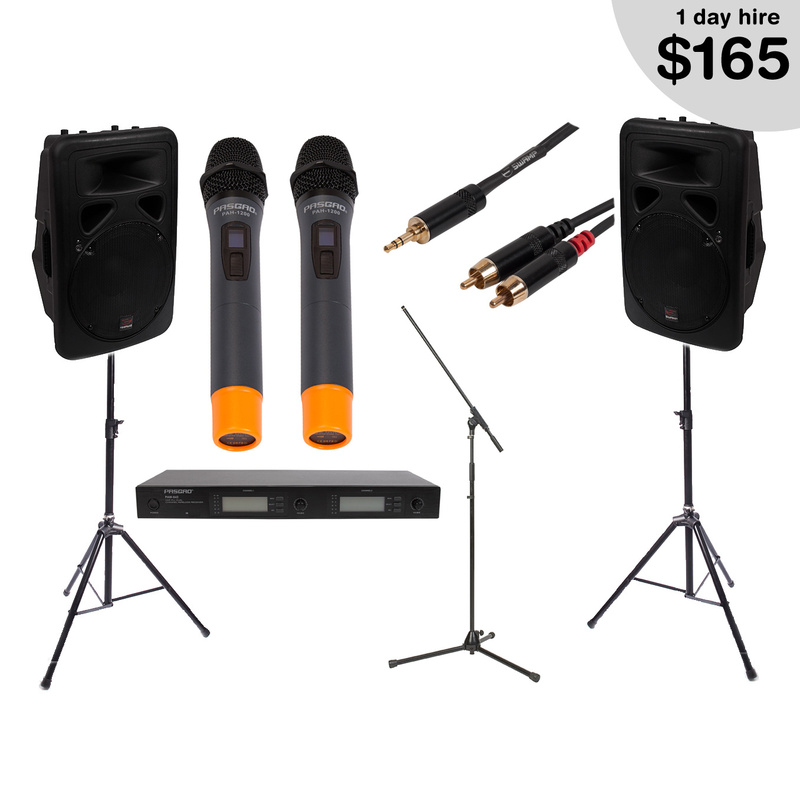 Featuring two dual 18" subwoofers delivering a deep low end that will excite and delight both patrons and musicians alike. 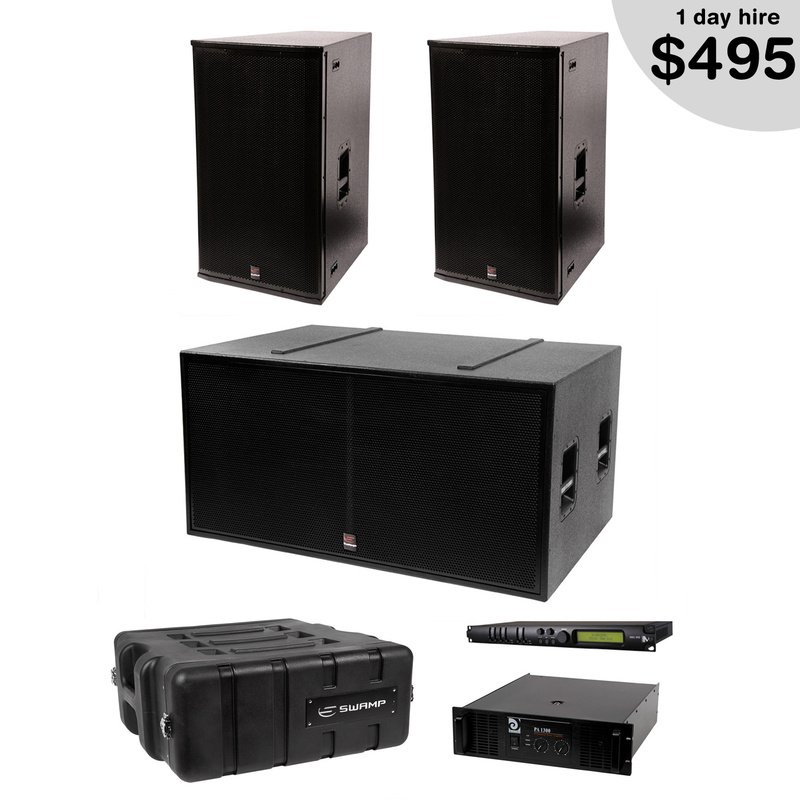 High powered long throwing 15" tops disperse sound evenly over audiences in front of stages up to 10m wide. Each speaker is driven from an individual 800W channel on the PS-8.0 power amp. 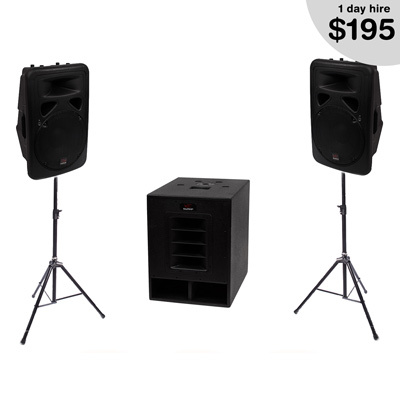 Plenty of power for medium sized public gatherings both indoor and outdoor. A digital signal processor is included and pre-tuned with our 'ideal' crossover settings for the system. However a laptop can be connected via USB to access the editing software for the DSP, allowing for customised EQ, Crossover, Gates, Compression, Limiting, Filters, Delays to be configured by the user. Suitable for up to ~450 people. 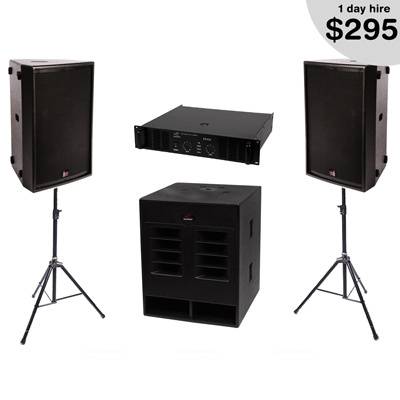 Cost effective, great sounding 8000W front of house (FOH) system available for hire in Canberra, ACT. 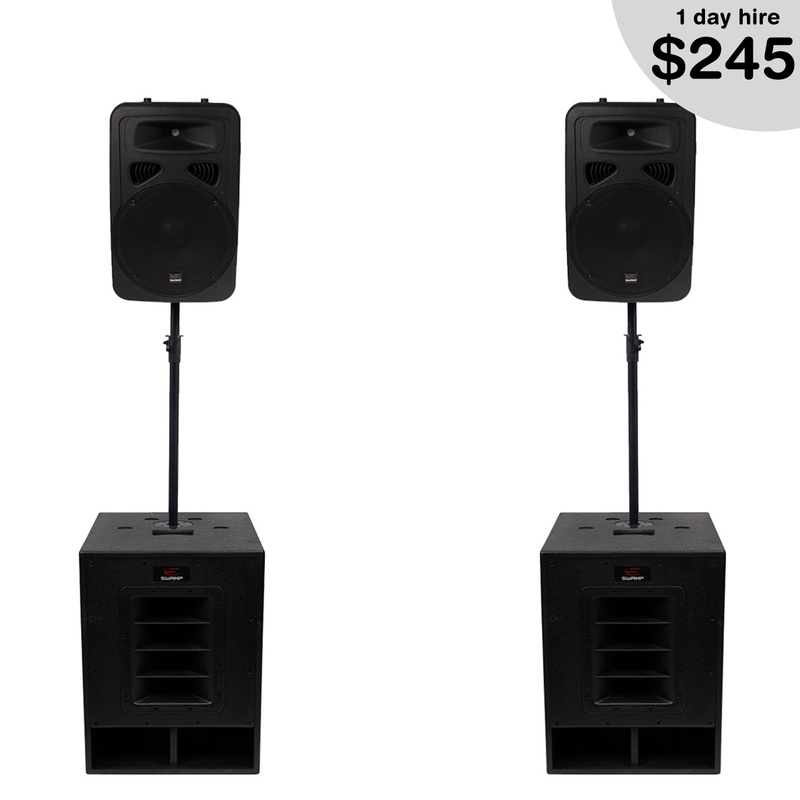 Featuring two dual 18" subwoofers delivering a deep low end that will excite and delight both patrons and musicians alike. The AH-3S 3-way high powered long throw tops consist of an internal 1x15", 1x10" and 3" horn. Each of the 3 drivers are powered by separate amplifier channels, allowing for a high level of sound scaping control. Each side of the system consists of 2x AH-3S speakers, linked in series. Suitable for up to ~600 people. 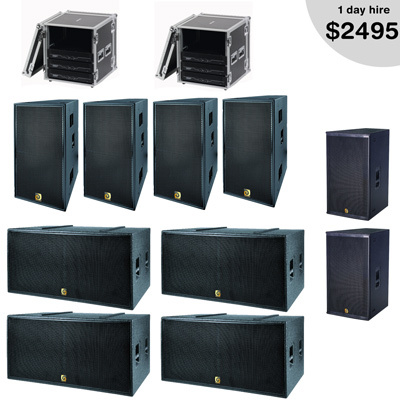 Cost effective, great sounding 12200W front of house (FOH) system available for hire in Canberra, ACT. Featuring four dual 18" subwoofers delivering a truly deep low end that will excite and delight both patrons and musicians alike. 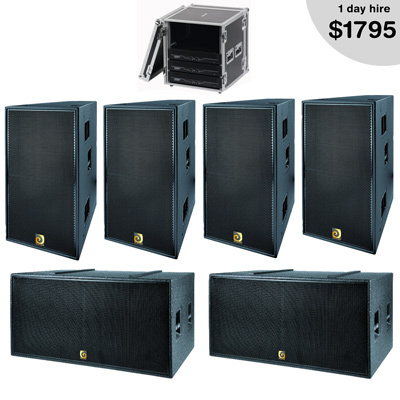 Also included are 2x 15" 450W RMS speakers that could be used for in-fill, out-fill or side-fills. Suitable for up to ~900 people. 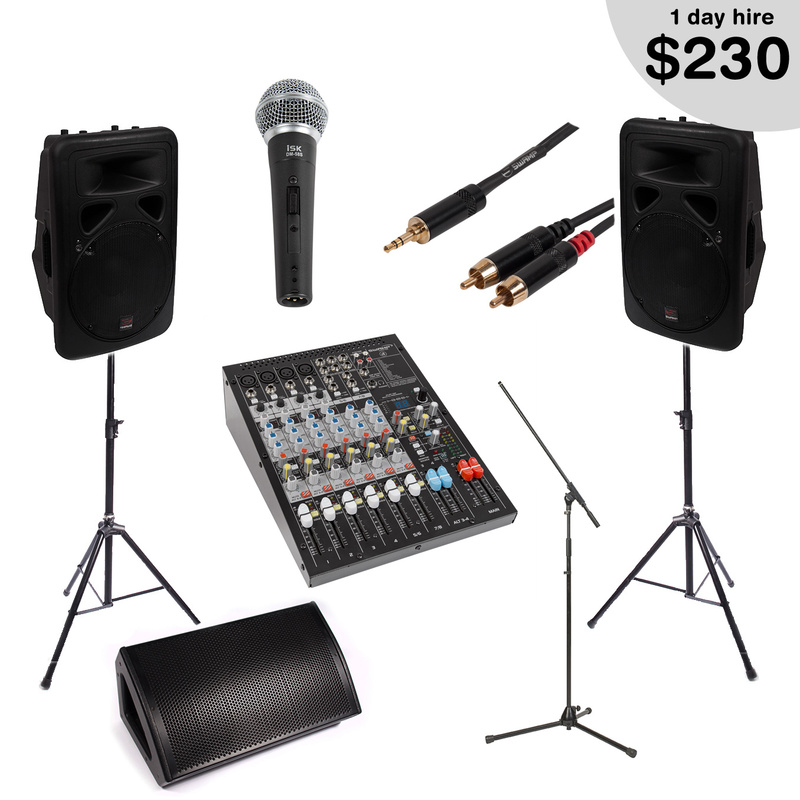 The ideal PA package for announces and spruikers needing a PA system for one off events, or when traveling in Canberra. Suitable for up to ~70 people. If you need a portable, battery powered PA system solution - look no further. This speaker can run for up to 10 hours without needing a recharge and has an input for a mic, instrument and audio cable. The 3.5mm (headphone jack) cable allows any smartphone / tablet / ipod or laptop to be connected to the system. Adjustable controls for the mic, instrument, audio input, bass, middle and treble. 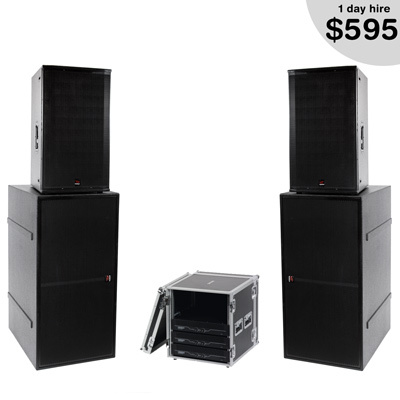 Ideal for PA system for marriage celebrants in Canberra.